As part of DOT regulations, each CMV driver must pass a DOT physical exam in order to obtain a commercial drivers license. In most cases, a driver will need to pass a DOT physical every 2 years. For CMV drivers, making appointments and sticking to schedules is not always easy. Wouldn’t it be nice to find a walk-in clinic for your DOT physical? Worried About Time and Money? Choose FastMed Walk In Clinic for Your DOT Physical. What else can you expect from FastMed? FastMed knows that your health is no place to cut corners. That is why we offer the best treatment from the best healthcare professionals without sacrificing convenience or affordability. 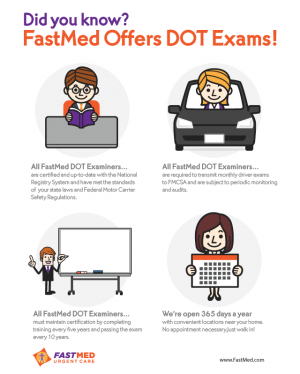 And with our flexible hours and team of FMCSA certified professionals, we hope you will choose us as your trusted walk in clinic for DOT physicals.